It is generally accepted knowledge that a product can go from idea to a million-dollar brand in a compressed time-period when the company has a few “out-of-the-box-thinking,” highly dedicated and laser focused marketing experts on board. “We are excited about these sponsorship opportunities and getting Buzz Pops in front of Hollywood celebrities who will Indulge on our treats. Being part of the red carpet at this Emmy's party is amazing. It is generally accepted knowledge that a product can go from idea to a million-dollar brand in a compressed time-period when the company has a few “out-of-the-box-thinking,” highly dedicated and laser focused marketing experts on board. This appears to be the case with Buzz Pop Cocktails. On the heels of multiple radio talk show interviews and backstage (runway) appearances at both Miami Swim Week and Los Angeles Swim Week, Buzz Pops was just selected to participate in the Honoring the Emmys® Luxury Gift Suite on Saturday, September 16, 2017 at the Millennium Biltmore Hotel in Los Angeles. This is the pre-Emmy’s celebrity event that will be attended by 150+ celebrities, their managers and the media. According to Buzz Pops CEO, Joseph Isaacs, “We are very pleased with the summer tour to date. Two swim shows, multiple Las Vegas events, an iHeart radio Mojate pool party event at the Surfcomber Hotel in South Beach and now this Emmy’s event in Los Angeles. We have been zig-zagging the country all summer." 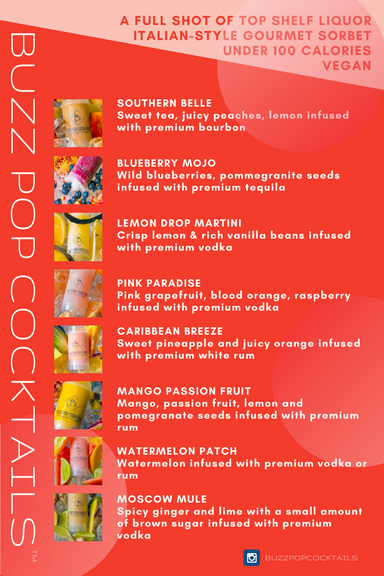 Buzz Pop Cocktails is right at home on the runways and red carpet events with fashion and swimwear going hand in hand. The Company is a title sponsor for the Style Collective NYFW (New York Fashion Week) Event – Blogger and Brand Party being held in New York City on September 8th, 2017. It’s not all about marketing for Buzz Pops. The company mantra is to give back to the community and it has sponsored the John Cushman Walk 2017 for Diabetes that begins at the Washington Monument on September 4th and ends in Mission Beach, San Diego on November 4th, 2017. “Our team evaluates thousands of events and sponsorship opportunities each year and less than 10% makes the grade in terms of uniqueness and opportunity that qualify for the full weight of our time and resources,” said Isaacs. Buzz Pop Cocktails holds the patented process for freezing high levels of alcohol with 15-40% APV (alcohol per volume) and this opens the door to dominate the specialty cocktail niche that, until now, has resulted in grainy consistency, slushy and poor tasting ready-to-serve dessert items with low alcohol volumes around 5% APV. Buzz Pop Cocktails offers seasonal fruit, whipped into a 5-star restaurant quality, Italian-style gourmet sorbet infused with top shelf liquor. At under 100 calories, vegan, gluten free with no artificial flavors or additives, cocktail aficionados experience an “Indulgent Premium Frozen Cocktail with a Healthy Twist” delivered in a single serve, nostalgic 1960’s style see through push pop. “We are excited and very humbled about these new sponsorship opportunities and our ability to get Buzz Pops in front of hundreds of Hollywood celebrities who will Indulge on our treats. Being part of the red carpet at this Emmy's party with attendees of this caliber is a major accomplishment,” said Isaacs. Launched in Las Vegas in March 2017, Buzz Pop Cocktails is the only ready-to-serve, all natural 100% fruit, gourmet Italian-style sorbet with the patent pending process for freezing the finest top shelf liquor brands with 15-40% APV (alcohol per volume) to uniquely serve their customers a high-quality, frozen specialty cocktail. It’s an “Indulgent Premium Cocktail with a Healthy Twist” delivered in a retro-style see through push pop. Buzz Pops completed the construction of its production and distribution center in the second quarter of 2017, just south of the famous Las Vegas strip to simplify coordinated distribution to hotels. Buzz Pop Cocktails has an out of the box marketing plan which includes distribution to hotels (F&B), pool bars, sporting arenas, celebrity and corporate events and cruise lines.